WOW what a stunning view of the Aska Adventure Area... Do not wait to book this HIGH VALUE mountain view cabin! Mountain High sums it up, perched on a ridge above the Aska Adventure Area. Mountain High offers 4 Bedroom, 4.5 Baths. 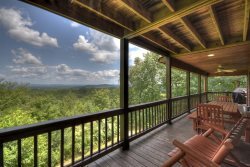 This lodge-style cabin in the prestigious Aska Adventure area very near Lake Blue Ridge & the Toccoa River, not to mention the other outdoor recreation activity convenience. Mountain High has easy access with all paved roads. Features include: vaulted ceilings, wide, covered, wrap around porches and AMAZING Mountain Views. The rock fireplace with gas logs in the living room combined with newly updated plush furnishings, provide cozy warmth and ambiance. The master bedroom located on the entry level has a King bed with patio doors exiting onto the spacious view deck that overlooks the beautiful Blue Ridge Mountains. The master bath offers the best of all worlds with a Jacuzzi tub, twin vanity sinks and walk-in shower with bench. You will be welcomed upstairs by a large sleeping loft features two full beds. The loft is balanced by two bedrooms on opposite sides of the cabin both offering large private bathrooms. Bedroom one has a king bed and bedroom two has a queen bed. The lower level features a bedroom with a Queen. The kitchen has all the up-to-date amenities everyone loves, black granite counter tops, microwave oven, stainless appliances and sink, along with a glass-top electric stove. A utility room is conveniently located just off the kitchen. After a day out on the local hiking trails or tubing on the Toccoa River. Kids and adults alike will want to spend some time playing ping pong on the standard-size table, air hockey, or a game of cards in the recreation room on the lower level. The lower level has also been refinished; a new wet bar awaits your cocktail hour and your space on this level has expanded! Don't miss out on the best feature of all: The total wrap-around porch and brand new covered outdoor fireplace! It's the perfect place to grill or just relax and watch the sun rise and set over the mountains. The hot tub is located on the lowest level also on the view side of the cabin. You can enjoy the cool, starry nights sitting around the newly updated fire pit with plenty of outdoor seating and charm. Don't forget your Laptop, Mountain High also has WiFi! All in all, Mountain High is a fabulous place to call "home" for a few days or a few weeks! Mountain High is the perfect family retreat in the Aska Adventure! Enjoy being Close-In to Blue Ridge & Tranquility of the Blue Ridge Mountains. Paved all the way to the driveway & Great mountain views! Enjoy Tasteful Decorating with Cabin Decor with mountain views from every room! Aska Adventure Area hiking and Biking. AT and Benton MacKaye hiking Trails. Lake Blue Ridge Boat ramp at Dry Branch. Lake Blue Ridge Day Use Area. Lilly Pad and New Leaf Adventures. Toccoa River tubing and canoe rentals. Everyone was helpful and friendly. The whole process from booking to checkout was straight forward. Again, we had such a great time, we are looking at dates to return next year and likely will be. Ack at least annually for years to come. Thank you! Summer was always nice and Jerry remained a pleasure to communicate with. The property was nicely equipped and well put together. The view has to be one of the best in the mountains. The AC worked well along with the hot tub and everything else. I was overwhelmed with happiness as well as my guest! The young lady that checked me in was so polite, knowledgeable and professional. She is definitely an asset. She was a delight, very happy and welcoming. Southern Comfort was very easy to book. I love that the web site gives the total price due when you enter the dates you are interested in staying. I also love that it allows up to the max amount of people to stay for that price. So many sites I searched want a certain amount for 4 to stay in the cabin then $15 per night for each additional person. Also the cleaning fee was included in the price with Southern Comfort, many other sites didn't disclose the total until you book. The steep and narrow road was a wild ride! There was some construction going on building other cabins on the road up to the cabin, I would hate to meet another vehicle on that very narrow road. Some parts were crumbling towards down the mountain. We actually leaned forward going up, it was a scary road. Actually, I already have recommended your cabins to several people. I am a hairdresser and my clients were made aware of our `Salon Sisters Cabin Weekend'. I have already recommended and sent the link of Southern Comfort Cabin Rentals to several of my clients, I'm pretty sure my other salon girls have as well. It was beautiful! The cabin, the scenery, the furnishings, the fireplaces; it's all breathtaking. I loved the hot tub, the game room, the kitchenette down stairs, plenty of bathrooms, the porches were awesome, the cub appeal is beautiful; it is hard to pick a favorite. But I will say the area downstairs with the sectional couch and tv made an excellent place to set up our karaoke machine, we had a blast! Cabin was clean and well kept! Beautifully decorated too. Lots of space! Pleasant and exceptionally easy experience with check-in and check-out. We loved the cabin! it had a gorgeous view of the mountains and had plenty of space for all our family and friends. We all enjoyed family time and fun in the game room. We had not one issue with the property during our 3 night stay. The entire process was so easy. Took care of everything online and promptly received a call to take care of the details. Great experience and will definitely book with Southern Comfort again! I loved everything about our cabin. It was even more well-equipped than we thought. In the future I will definitely be using Southern Comfort cabin rentals for my next mountain getaway. Amy was fabulous in guiding me to the perfect cabin. We were traveling with my elderly parents who have mobility issues, our 2 grown children and their spouses, and our 1 month old granddaughter. Amy listened to all of our needs and found the right cabin for us. Beatrice was also very helpful with compensating us for the inconvenience of the water issue. She worked with the owner to find a solution that was satisfactory to all involved. Everything was ready for us when we arrived. All our questions were answered. A member of the staff called us the morning after check in to make sure everything was okay and there were no needs. This cabin and location are wonderful and just as advertised. We will return and recommend it to our family and friends. Fully equipped kitchen for preparing and serving meals.